Dozens of wildfires are blazing across the American West, including in California, Oregon, Nevada and Colorado. In addition to burning homes and large areas of forests, fires are causing dangerous levels of air pollution in some areas. The map below shows near-real time air quality data from OpenAQ and fire alerts from NASA. Levels of fine particulate matter (PM2.5), an easily inhalable pollutant linked to heart and lung disease, asthma and more, have reached dangerous levels in some locations. One of California’s largest wildfires is burning near Yosemite National Park. PM2.5 levels reached 142 micrograms per cubic meter (μg/m3 ) in Yosemite Valley, California. The World Health Organization (WHO) recommends a daily maximum exposure of 25 μg/m3. (A microgram is one millionth of a gram.) In northern California, levels of PM2.5 reached 52 μg/m3 in Redding and 39 μg/m3 in Red Bluff. Parts of southern Oregon are also experiencing potentially hazardous of air pollution. PM2.5 readings in Shady Cove, Cave Junction and Klamath Falls reached 55 μg/m3, 73 μg/m3 and 82 μg/m3, respectively. Wildfires tend not to receive as much attention at the global scale as a main contributor to air pollution, compared to city traffic and coal-fired powerplants. This recent spate of fires helps bring their contribution to surface. Whether smoke plumes originate from wildfires in America, crop burning in India, or domestic heating and trash burning in East Asia, their impacts on human health are one and the same—and should not be overlooked. 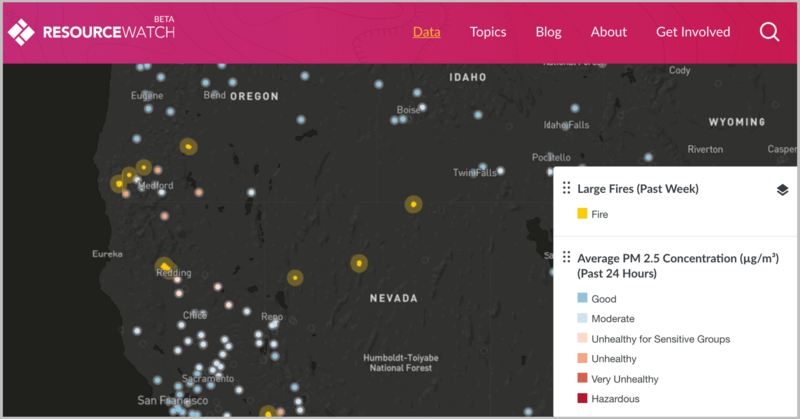 Track fires and air pollution levels near you using near-real time data on Resource Watch.